With DC’s “New 52” reboot of Dial H China Miéville has re-entered the genre of comics after a guest episode of Hellblazer and a much-discussed but ultimately rejected pitch for Swamp Thing (cf. Narcisse). The original series Dial H for Hero followed the escapades of a series of ordinary humans who were granted temporary superpowers by dialling the letters H-E-R-O in sequence on a mysterious Dial (cf. Sunu). The challenge for Miéville consists in working with an already established universe and taking the narrative to new and unexpected places while staying faithful to what’s already there (cf. Narcisse). Moreover, superhero comics have long predominated the genre, and while they enable the writers and artists to explore extreme scenarios like war or natural disaster, superheroism has often been used as a deus ex machina device, which implies a view of superhero comics as inherently escapist. Various graphic novels such as Frank Miller’s The Dark Knight Returns and Alan Moore’s Watchmen have challenged and critiqued this notion from within the medium. Erich Origen and Gan Golan’s The Adventures of Unemployed Man, which features heroes like Everyman and Wonder Mother and such villains as the Just Us League and the Invisible Hand, depicts paranormal characters as overt political metaphors. However, it is being advertised as comic relief, which poses the question whether it even aims at providing an anti-escapist alternative. Jeffrey J. Kripal defends comicbook superhumans to some extent. He speaks of superpowers and the metamorphosis of the human form as tropes taking up mythical themes from the religious imagination (Kripal 1). Underneath the mythical layers, he implies, elemental truths can be found. Additionally, we must take into account that religious imagery is directly related to the sublime. As China Miéville explains, the ecstatic element of the encounter with the sublime comprises both joy and fear. There is always a chance that the awe experienced by the viewer or protagonist can tip over into horror (cf. VanderMeer). Superhero comics featuring a protagonist who has acquired superhuman powers rather than being born with them enter a special relationship with this notion of the sublime. In Dial H the hero faces the challenge of never completely surrendering to the supernatural element in order to not let it usurp or erase his identity (cf. van ‘t Zelfde). Furthermore, Kripal argues, superpowers can be understood as “a dramatic physical manifestation of the meaning and force of consciousness itself” (Kripal 2). Consciousness and popular culture are deeply interconnected (Kripal 5). Thus, the ways in which ordinary humans interact with the supernatural, the Weird sublime, impart information about (the limits of) human consciousness and human possibilities. In Dial H Miéville introduces an interesting new take on superheroism, implying that there is a risk of developing an addiction to superpowers and of losing one's own identity in the process. This notion is reinforced by the complex interplay between the storyline and corresponding page design and panel composition, directing or deliberately breaking up the page flow. Comic panels can to some degree be analysed like frames of film (cf. Kripal ix). However, while film is a temporal medium, comic books are a spatial medium. Temporal effects must therefore be dealt with using page design and panel composition. Establishing the genre (and reading process) of comicbooks as related to Umberto Eco’s concept of the Open Work, Levin and Albright explain: "Comics, at every moment, ask the reader to contribute meaning and interpretation. [I]n that white gutter between panels, the comic reader switches from passive viewer to active participant in the construction of meaning" (Levin/Albright, n. pag.). Every time there is an indicator that interaction between characters is taking place outside the physical page, this interaction exists only in the imagination of the reader. “The reader is asked to become the performer of the strip” (Levin/Albright, n. pag.). Page design and panel composition is prominently about directing the reader’s eyes and attention (cf. Czap). A related effect is the pacing of a story by pacing the reading process. For example, cause and effect can both be depicted in a single panel to convey the idea of witnessing time pass through action in a single unmoving image. Thus, a whole fight between two or more comicbook characters can take place within a single panel. Ed Piskor illustrates this with a panel from Frank Miller’s The Dark Knight Returns, explaining that “the action would probably take as much time to occur as reading the image from left to right” (Piskor). Similarly, the breaking up of panels results in a breaking up of the page flow. This technique can be used to deliberately cause a sense of confusion and disorientation in the reader. In the context of the interrelation of popular culture and human consciousness, the establishing or dissolution of framed panels gains additional implications. One of the basic functions of the human mind and of the categorising mechanisms we subsume under the term of “culture” is imposing order on the world in order to be able to deal with its unknowability and incalculable chaos. 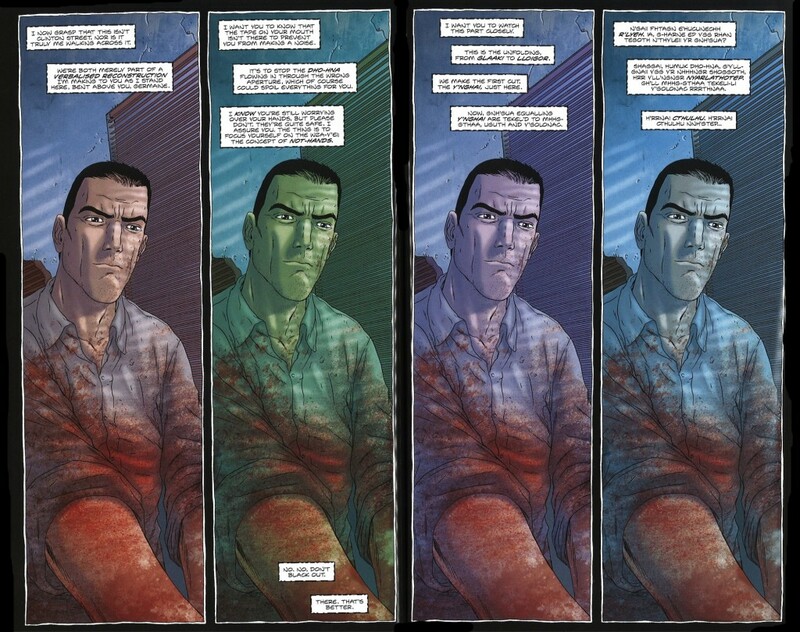 In comicbooks, the individual frames bordering panels impose order and keep things in place. When the mind goes, when human consciousness gives way (at times to other, alien forms), frames vanish. In The Courtyard Alan Moore and Jacen Burrows use rigid programmatic framing to illustrate the protagonist’s psychotic break. Especially the last pages’ echoing of the beginning in a new horrific context conveys a bleak inescapability. Most significantly, the frames cut off above the atrocities mentioned in the captions, and the reader’s imagination must fill in those lacunae. In contrast to this, the hallucination scenes consist of images running into each other without any borders or frames. 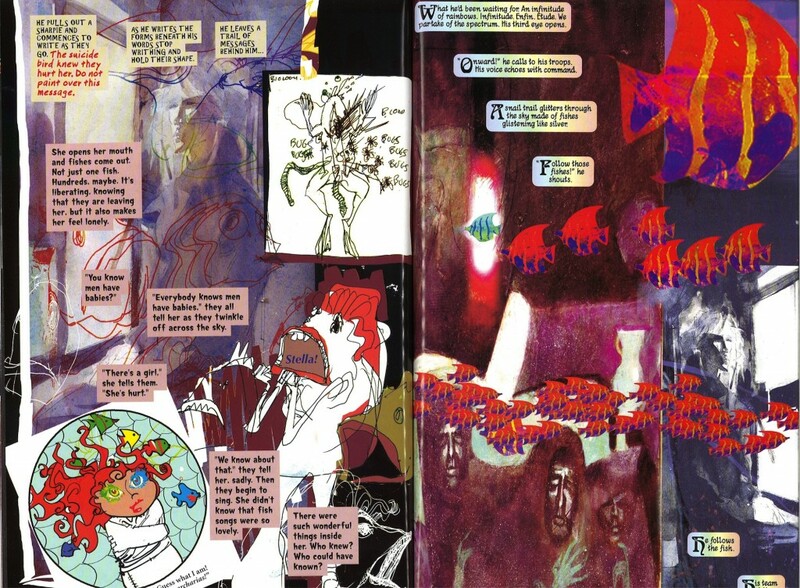 Neil Gaiman, in collaboration with various graphic artists, uses a similar technique in Sandman to hint at the traumatic backstory of the character of Delirium (who used to be Delight). One key scene, clearly reveals an undercurrent of sexual violence, implying that the chocolate people, treated as objects, are capable of experiencing “fear” in a sexualized content (Gaiman et al: Brief Lives). Again, as long as Delirium imposes mental control, the panels are repetitively and rigidly framed. When her backstory is revealed, in the moment of trauma, mental breakdown and the retreat of logic, panels are broken up, invade other panels, everything looks broken and scribbled, all styles intermingle in a chaotic burst. Nothing makes sense anymore. Finally, in the last bit of empty black space before the story ends, Delirium, now transformed, reinstalls frames – and an order that speaks of trauma and the inadequacy of representation: “I have heard the languages of apocalypse, and now I shall embrace the silence” (Gaiman et al: Endless Nights). The first page of Dial H #1 serves to orient us. “Littleville,” the captions say, “Gotta love it. It’s had better days. But who hasn’t?” (Miéville & Santolouco, Dial H #1), thus establishing a meta-discourse relating to the subgenre of superhero comics as well as positioning the character of Nelson Jent, our “most unlikely hero”, in the larger context of a failing economy. So far, he has had little control over events, if any. He is depicted as an overweight, unemployed, chain-smoking wreck of a man who has recently suffered a heart-attack and who claims (with a maniacal look on his face) that all that he wants is a distraction (Miéville & Santolouco, Dial H #1). This suggestion reinforces the notion that superhero comics are often escapist fantasies, even before the main plotline is established. In the moment of Nelson’s first transformation, the theme of control is firmly established. Suddenly he has an arsenal of random superpowers that he can call up whenever a problem presents itself. Simultaneously he runs the danger of developing an addiction to them, and of losing his own identity in the process. In order to stress the destabilizing experience of trading in one's identity for a series of bizarre alter egos that range from composite monsters to the abstract and decidedly non-human, the story is told in sudden chaotic bursts and flashbacks rather than chronologically. In the beginning the reader only knows what Nelson knows, which means that his superpowers and their source remain a complete mystery. Mateus Santolouco’s visuals add to the sense of confusion and destabilisation. Nelson’s first metamorphosis is marked by an extreme disruption of the page flow. Orderly panels are replaced by a mosaic of fragments, like a chaotic stained glass window or a weird spiderweb. Nelson’s alter ego, Boy Chimney, is depicted from multiple angles (including axis-jumps between frames, to use another film analogy). The spiderweb reference becomes especially important when Boy Chimney invokes his special power, speaking in a disjointed, grammarless stream of consciousness that recalls the utterly alien character of the Weaver from China Miéville’s novel Perdido Street Station. He is also able to see everything happening in the city, as in the Weaver’s World Web. 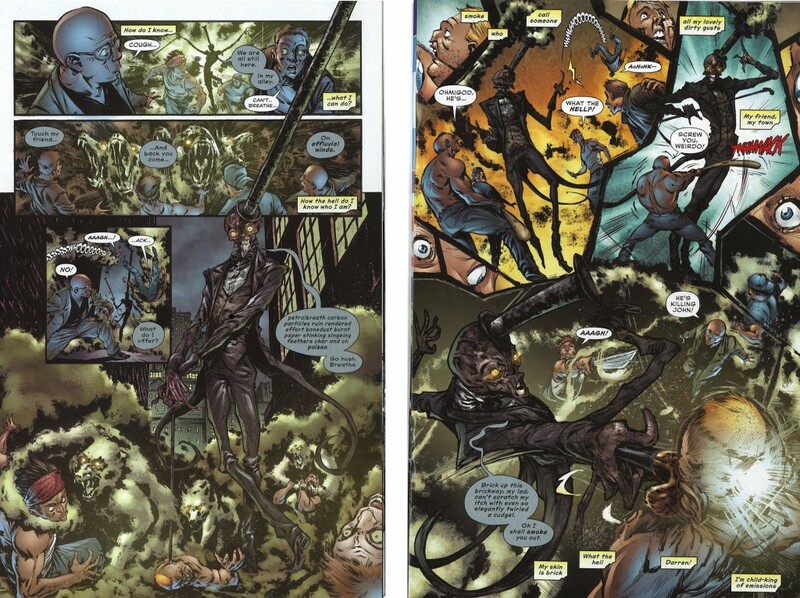 The breakdown of the panels was mentioned in his script, Miéville says, but “the (terrific) artist took it to a much greater degree than even I'd imagined. That's one of the great pleasures of this medium, is that the collaboration ends up making things further and better than one originally imagines” (China Miéville, private correspondence). In issue #3 Nelson meets his future mentoress Roxie, who always dresses in the cloak and mirror-mask of “Manteau”, regardless of what powers the dials give her. At Roxie’s we learn that Nelson retains some memories that are not his own but belong to the superheroes whose identities he borrowed. 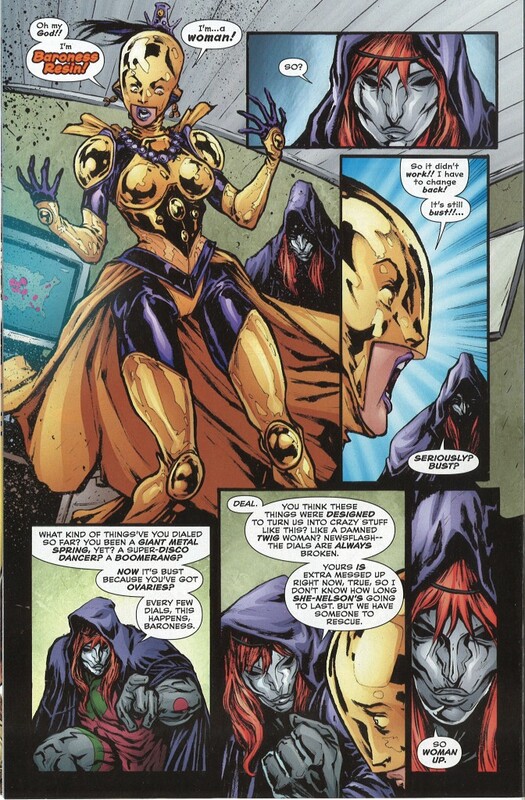 Roxie explains: “The cloak, the mask… It’s not just disguise. This is what keeps me here. No matter what each new memory in my head tells me. I know my name already. Manteau” (Miéville & Santolouco, Dial H #3). Nelson would profit from using the same method: “Listen. You have to get this in your head. It was… always you. And if you’re going to do this… you have to remember that. Otherwise… you’ll be lost” (Miéville & Santolouco, Dial H #3). In accordance with the recurring meta-commentary established by Miéville, the assumption that the Dials have always been broken also lets us question superhero myths in general. Moreover, as we learn more about the origins and nature of the Dials in a special issue numbered #0, the moral question of possible identity theft is raised. The tentative backstory is based upon a many-worlds theory; superpowers are taken from beings from another dimension without their permission or knowledge (cf. Miéville & Burchielli, Dial H #0). This contextualisation redefines the acquisition of superpowers as an act of theft, or rather of “choice-theft” (another possible reference to Perdido Street Station). It shows us once more that comics are a unique form of literature that can be used for self-referential and anti-escapist approaches towards literature and culture and raise important questions concerning humanity and ethics. If superpowers represent tools or weapons we humans should not wield – they can, for example, be read as weapons of Mass Destruction – we have to ask ourselves what cause, if any, justifies their use – and ultimately, whether we are authorized to use them at all, and if so, at what cost. Christina Scholz is currently writing her PhD thesis on China Miéville’s fiction. Her Master’s thesis, Thanateros: (De)Konstruktion von männlichen Heldenbildern im Mainstream-Film, has been published by AV Akademikerverlag in 2012. Gaiman, N. & J. Thompson & V. Locke and D. Giordano & D. Vozzo & T. Klein & D. McKean. The Sandman: Brief Lives. The Sandman Vol. 7 (New York: Vertigo, 1994). Gaiman, N. & B. Sienkiewicz. “Chapter 5: Delirium. Going Inside.” The Sandman: Endless Nights (New York: Vertigo, 2003). Kripal, J. J. Mutants & Mystics: Science Fiction, Superhero Comics, and the Paranormal (Chicago & London: University of Chicago Press, 2011). Miéville, C. Perdido Street Station (London: Macmillan, 2000). Miéville, C. & M. Santolouco. Dial H #1: “A Most Unlikely Hero!” (New York: DC Comics, Jul 2012). Miéville, C. & M. Santolouco. Dial H #2: “Power Up?” (New York: DC Comics, Aug 2012). Miéville, C. & M. Santolouco. Dial H #3: “Disconnected!” (New York: DC Comics, Sept 2012). Miéville, C. & M. Santolouco. 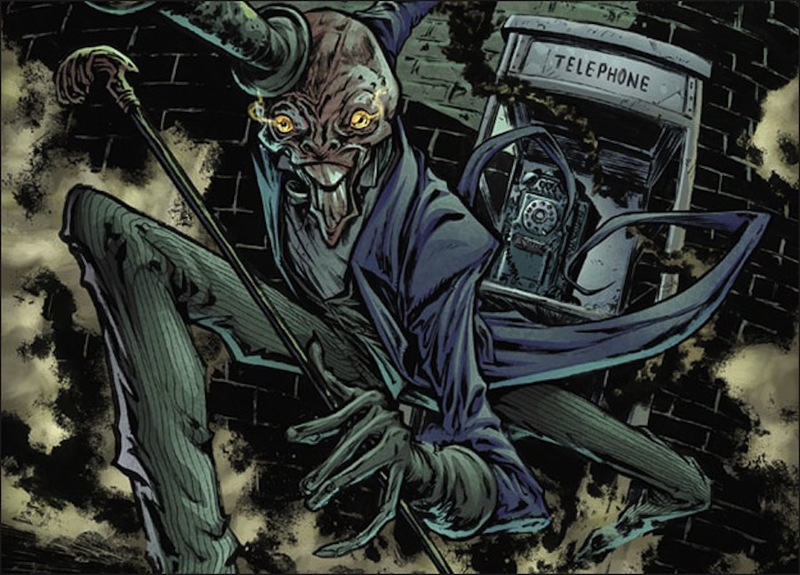 Dial H #4: “Hollow Inside!” (New York: DC Comics, Oct 2012). Miéville, C. & R. Burchielli. Dial H #0. (New York: DC Comics, Nov 2012). Miller, F. & K. Janson & L. Varley. Batman: The Dark Knight Returns (New York: DC Comics, 2002). Moore, A. & D. Gibbons & J. Higgins. Watchmen (New York: DC Comics, 2008). Moore, A. & J. Burrows. The Courtyard. Neonomicon Collected (Rantoul, IL: Avatar Press, 2011). Origen, E. & G. Golan. The Adventures of Unemployed Man (New York: Little, Brown and Company, 2010). Very interesting. I hadn't considered the series in relation to The Sandman before. Regarding style and its conceptual freight I'd thought of Boy Chimney and Iron Snail as comparisons for Grant Morrison's Doom Patrol, and the shifts in panel style, format and layout in relation to the Brotherhood of Dada in The Painting That Ate Paris – you've opened up some really intriguing comparisons regarding the nature of the Endless and the DCU (especially given the cameo by Batman, Superman and the Martian Manhunter in The Wake) and the role of the dials as the series develops. Thank you for your insightful comment – and for reminding me of these Sandman cameos. You’re right, the parallels in style do open up a lot of interesting topics in the larger context of the DCU. I almost included some panels from <i>Batman: Arkham Asylum</i>, in which Batman’s sanity is questioned, and which also uses similar techniques. And I would have loved to discuss recent developments in <i>Dial H</i> regarding „choice-theft“, especially The Flash’s guest appearance and the ongoing non-discussion of what happened between Nelson and Roxie (and between issues to boot!) – but those issues weren’t out when I sent in my article. Well, I hope I’ll find a place for that somewhere. Roxy and Nelson's relationship has been such a great anchor for the series, and with them being such a close pairing it seemed likely they would have some sort of 'unspoken' event. Using the perspective of the Flash also works nicely with your discussion of the subjective effects of the identities by accelerating the reader through the process of (re)revealing the potential choice-theft at work. I'm intrigued by the new angles being played by The Centipede which further accentuate the similarities between his powers and structural role and those of Uther Doul in The Scar and I wonder about comparison between Roxy and Bellis Coldwine in terms of both being too close to their missions to be able to see or consider wider agendas and consequences. "New angles" indeed. Have you noticed the wonderful "wrong" perspectives (e.g. the distorted bird's eye view in Centipede's scenes in issue #11)? I love your comparison of him and Uther Doul, although I see Centipede's powers as opposed to the effects of the Possible Sword. But it's true, he didn't start out as one of the big baddies either, but as one of their minions – so I'm curious as to his further development. I'd read it as similar to the angular and overlapping frames used to distort the relationships of sequential panels by John Coulthart, it does really come into its own in that episode. I'd like to see more on how the subjective distortion of The Centipede's temporal distortion affects his viewpoint (I wonder if we'll see some sort of garden-of-forking-paths-POV for him in subsequent episodes – seeing ((and sending)) versions of himself ((to)) die must have some bizarre effects on his mind). He does also leave open the question of whether you can 'dial a villain' or if they have to be made. Good point! I guess if you can "dial G for gear" now, you can certaily dial V for villain! In any case it's worth considering… if sidekicks can (once more) choose to disobey, just think about the options for "predestined" villains. (After all, Abyss was more a prisoner than a villain, and we haven't had any stereotypical villains so far.) I'm also intrigued by the idea of Canada (of all options!) as a sort of "enemy on the doorstep".